R Madhavan is certainly the only South based actor to have made his presence felt in Bollywood and now he is doubling himself as a film producer with his upcoming film SAALA KHADOOS. Further with name of popular filmmaker Rajkumar Hirani associated with film, the movie is attracting huge publicity but the major problem facing both R Madhavan and Rajkumar Hirani is that the movie, even before its release, is being compared to Shah Rukh Khan’s CHAK DE INDIA and Priyanka Chopra's boxing film MARY KOM! 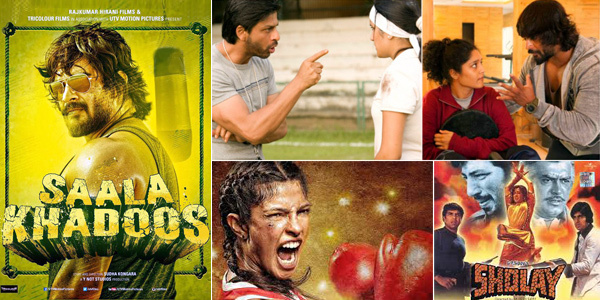 On the surface yes like CHAK DE INDIA (2007) and MARY KOM (2014), R.Madhavan’s SAALA KHADOOS is an emotional tale of determination and perseverance inculcated by a coach into his student to achieve her goal. Well if we look back in 2005, national award winner filmmaker Nagesh Kukunoor’s film IQBAL had a same similar script depicting a wrecked ex-cricketer battling his energies to give a place of pride to a handicapped talented youth, which he could attain in his hey days due to dirty politics. The movie though made on a shoe string budget was a runaway hit. Thus proving that the subject may be the same but what makes a movie successful is the treatment both by a competent script writer and an accomplished film director. To illustrate my point more clearly, I take my readers back to the 70’s when not one but four films were made on a same subject about a handful of criminals encouraging villagers to take upon the atrocities of a dreaded dacoit. Interestingly all the four movies viz. MERA GAON MERA DESH (1971), KHOTE SIKKAY (1974), CHOR MACHAYE SHOR (1974) and PRATIGYA (1975) were hits. However what may stun readers is that popular writer pair Salim Javed too took the same ‘oft repeated’ subject and brilliantly re-wrote it into Indian’s biggest commercial blockbuster SHOLAY! Credits must be given to brilliant filmmaker Ramesh Sippy to deftly tackle the run of the mill subject!!! So who is the 'SAALA KHADOOS’ of superstars Hrithik Roshan, Ranveer Singh and Anushka Sharma? Mumbai is known for its typical slangs popularly known as the ‘Tapori or Bambaiya (Mumbaiya) Language’ which may not sound quite polite but is generally heard among the locals. Bollywood has seen many actors replicating these Tapori characters remember Amitabh Bachchan as Anthony bhai in AMAR AKBAR ANTHONY, Aamir Khan in RANGEELA or Shah Rukh playing the role of a tapori Max in JOSH. Among the famous Mumbai slangs include Ek Dum Jhakaas Bidu (You Going Perfect), Waat Lag gayi… (Being in a problem), Locha Hogaya or Lafda Hogaya(Messed up Or There is some problem) and many more. Among these umpteen Tapori slangs of Mumbai, one is Saala Khadoos, which literally means our mentor or a strict teacher who plays a lion’s share in the success of his student. 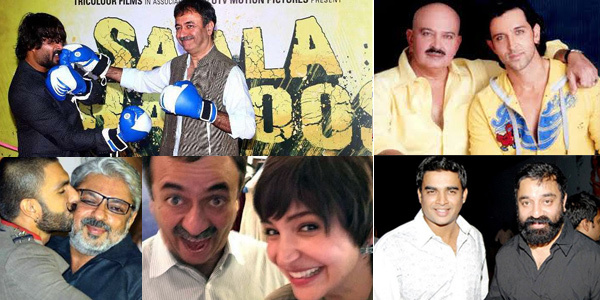 To give momentum to his exceptional style of publicity Hirani asked other actors on social media to reveal their life's Saala Khadoos. Soon the social media was flooded with a chain of film celebrities revealing their life’s Saala Khadoos. The first to initiate Hirani’s innovative campaign was none other but R. Madhavan, the hero and the producer of SAALA KHADOOS. Opening his heart out Madhvan put the image of his mentor Kamal Haasan and wrote: Here is Mera Saala Khadoos who pushes me to give my best? Who is yours?" Among the others celebrities who revealed their mentors included superstar Hrithik Roshan naming his father Rakesh Roshan, BAJIRAO MASTANI actor Ranveer Singh declaring director Sanjay Leela Bhansali, Anushka Sharma calling Raj Kumar Hirani and Munna Bhai M.B.B.S. actor Boman Irani too naming Raj Kumar Hirani for changing his career!